No, seriously, just measure out the spices and drop them all into a bowl. No "add spice to skillet, stir for 30 seconds, repeat 148 times until you can't remember what you are cooking" here, nosirree Bob! Start boiling up the water for the rice, by the time you are fluffing up the grains, the chicken is ready to serve. Garam masala is a combination of many different Indian spices jammed into one convenient jar. I think every brand of the stuff has its own proprietary combination of aromatic spices. If you can't find any garam masala in your local Try-n-Save, substitute by adding an extra 1/2 tsp. of cinnamon along with 1/8 teaspoon of every other spice listed. I have been slurping up ... I mean dining on butternut squash soup lately. Since it's in season, many restaurants have been featuring butternut squash soup, and I have accommodated them by indulging. My favorite version was served in the Tierra Sur restaurant at Hertzog Winery. 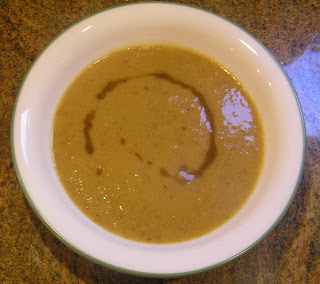 Even TheHubby liked it, and he doesn't like butternut squash! I wish I could recreate it, but all I could discern, besides the squash, was the usual pumpkin-like spices. So I tried this version from A veggie Adventure instead. It does not use cinnamon nor other pumpkin-ish spices; it has goodies which gives it more of an Indian flavor, including the not-so-secret ingredient mango. But it is so excellent that I decided to be thoughtful and share with you anyway, Dear Reader. Here is a gluten-free chocolate cookie that doesn't taste gluten-free. A parve cookie that doesn't taste parve. A Passover cookie recipe that doesn't taste pesadik. 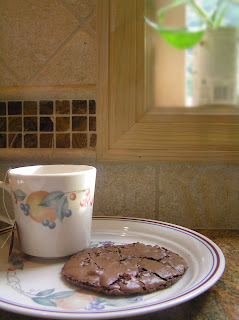 A flourless chocolate cookie recipe that ... well, you get the picture: a wonderfully delicious fudgy cookie created by Gretchen over at Kumquat. Many people think it's way hard to separate egg whites from their yolks. If you have no separation anxiety, then these babies are trés easy to whip up ... because no whipping is needed! Leave your mixer in the garage. No need for the whites to be at room temperature. Use eggs straight from the fridge if it suits you. No need to be upset if a little yolk accidentally drops into the mix since, unlike most egg white recipes, it won't affect the outcome. I do need to warn you though .... the cookie "dough" tends to spread out a little ... and by a little I mean a LOT. Next time I plan to use one less egg white, or maybe smaller eggs.